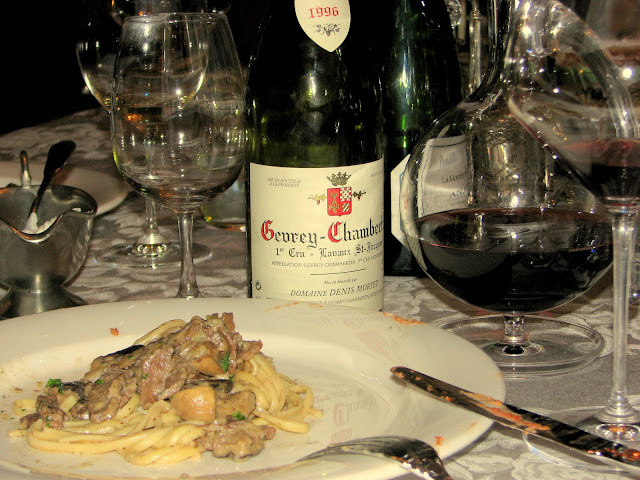 Mission: find a wine pairing for a creamy mushroom beef stroganoff. I cook a particular type of beef stroganoff - "triple mushroom medley" - as I call it. It's a combination of shitake, button and oyster mushrooms, browned and then sauteed in sour cream broth with shallots and thin strips of short rib meat until the meat is tender, and all the flavors fuse into a deliciously creamy mushroom beef stroganoff. I enhance the flavor of mushrooms with a pinch of nutmeg, savory, and parsley. Served on top of linguine pasta. The perfect side for this kind of Russian dish is pickled tomatoes and cucumbers, to balance out the creaminess of the main dish. Analysis: I needed a wine that was earthy (to match the mushrooms) with some age (for slightly oxidized, pickled effect), soft, with medium body so as to not overwhelm the mild and creamy texture of the ingredients. It took a little bit of thinking... I happened to have a prized bottle of 1996 Lavaux St. Jacques (1st Cru) from the village of Gevrey Chambertin in Côte de Nuits region of Burgundy, produced by Domaine Denis Mortet (well-regarded, and now unfortunately deceased, French vintner). Still I wasn't 100% sure if the Burgundy were going to hit the mark until I tasted it with the food. Fantastically, exceeding my expectations, the 12 year-old wine showed beautifully. Dark ruby color, medium body, the fruit was still fresh but not in your face (in that perfect Burgundian way). The acidity was combined seamlessly with unidentifiable red berry flavors, complemented by earthiness and almost coffee-meet-pickled-cherry like aroma. Mission accomplished: 1996 Gevrey-Chambertin, Lavaux St. Jacques from Domaine Denis Mortet. Happy birthday, Dan! A sublime pairing it was! 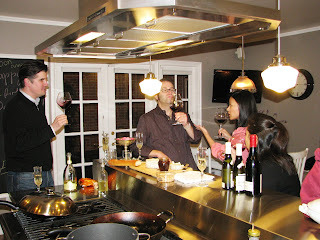 Of course gracious hosts make the wine taste even better, even if subliminally so! Thanks a ton guys, appreciate it! Which wine matches with central asian pilaf?